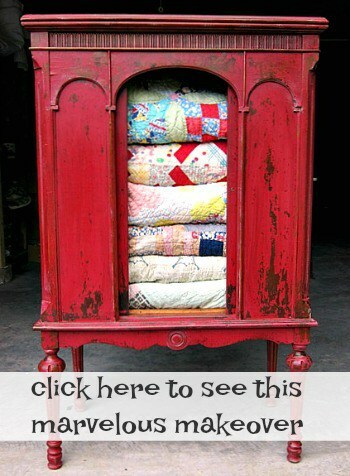 I found out there is a secret to the perfect furniture makeover. The secret is in the simplest and sometimes the smallest detail. And every furniture makeover is different. What works for one piece doesn’t work for another one. When I’m talking perfect I’m not talking no brush marks or things like that. 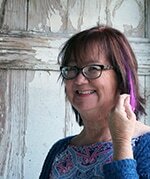 I’m talking about something added, or a high-lighted detail, or something totally unexpected that “makes the makeover”. 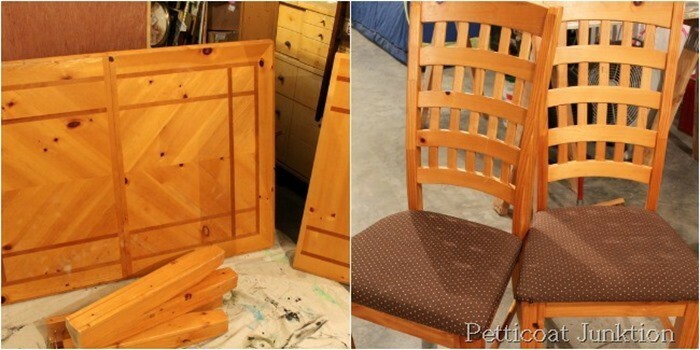 Every furniture makeover is not going to be perfect. The four makeovers today have a little something extra that I think makes them perfect. I bought this piece at my favorite junk shop, where else. I thought with a little work it would make a perfect TV stand. The ever handy JTS cut a back for the stand thingie. Not sure what to call the piece. I do know it has a lot of curvy details that make it look very country. The top of the back looked like it needed something. 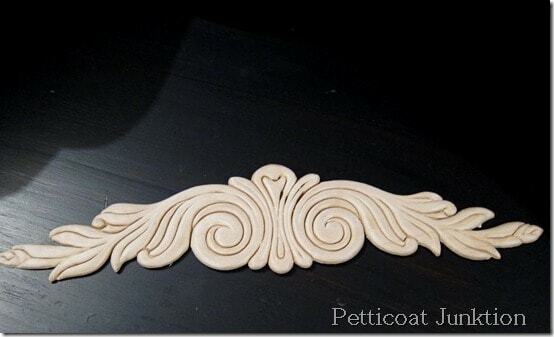 I found the unfinished wood applique in my stash and decided it might work. And it did. I could have placed the applique lower on the back but I thought covering up that deep curve looked best. And as always I think I was right (insert Kathy smiley face). The black and white knobs have been in my stash for a while. They came from the Hobby Lobby clearance aisle and I couldn’t get any more and I only had two. I found a glossy black knob for the center. The paint is Beyond Paint in Licorice. You guys have heard me talk about this paint before. I use it a lot. 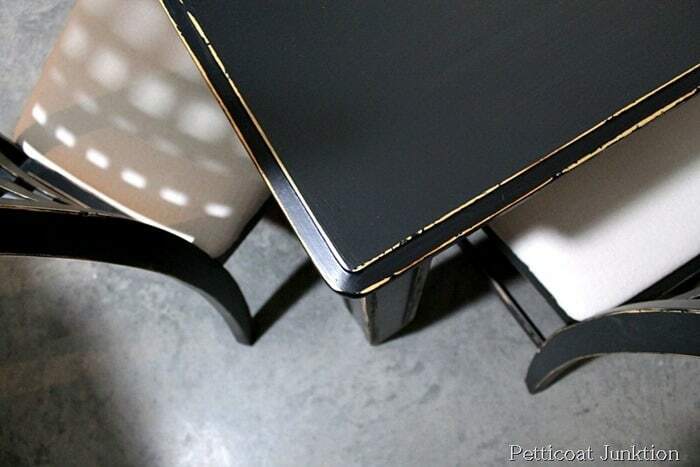 No priming or sealing required with this paint and the sheen is perfect. The baskets were just for staging, they’re mine. I love those old locker baskets. I keep my fabric stash in them. 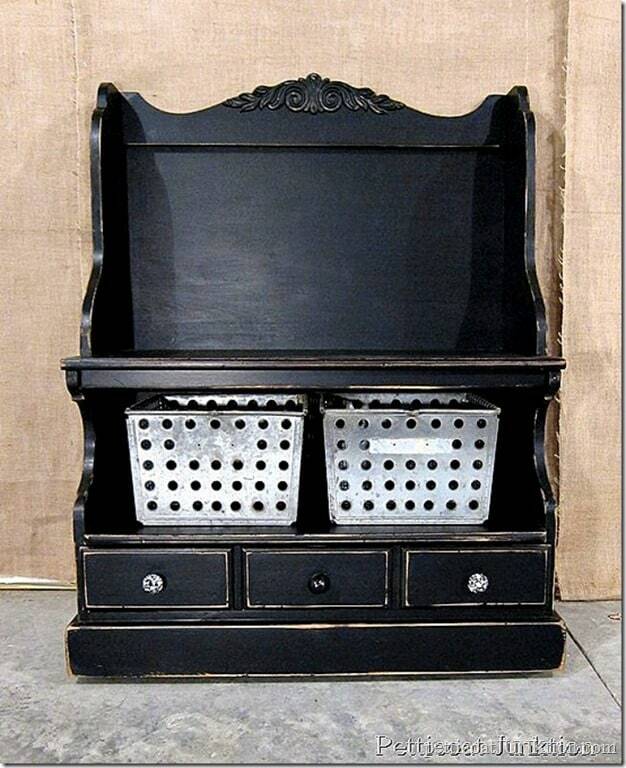 I can see many uses for this piece; TV/Entertainment center, bench, foyer catchall, blanket storage, etc. I bet ya’ll can think of more. I spied this sad thing at the Nashville Flea Market and it was cheap. I could see potential so I brought it home. It was obviously homemade but it was real wood. 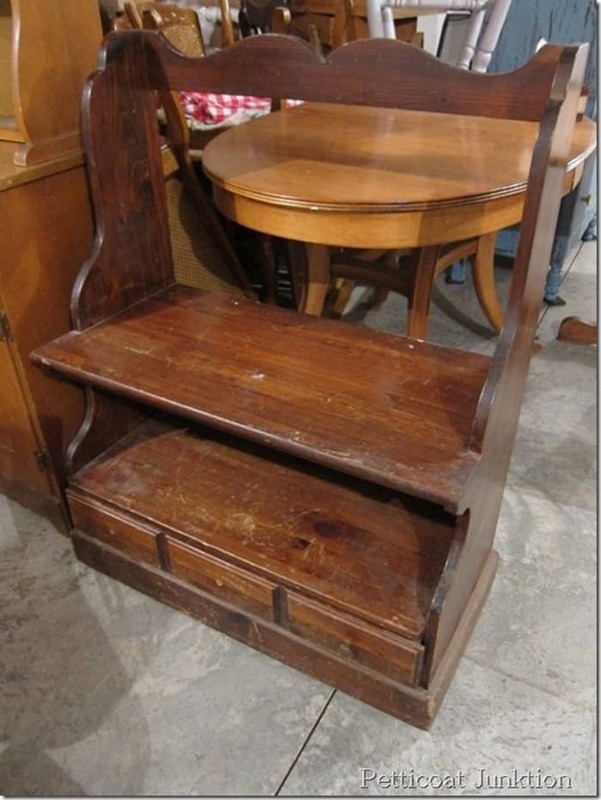 It’s getting harder and harder for me to find wood furniture to paint. Is any one else having the same problem? The JTS added casters/wheels. An addition that really made this piece. I know that sounds weird but it did. It set flat on the floor before with no legs or skirting and just didn’t look right. I picked up the nice little casters at Home Depot (not the cheap plastic ones) and the cabinet moves like a dream. 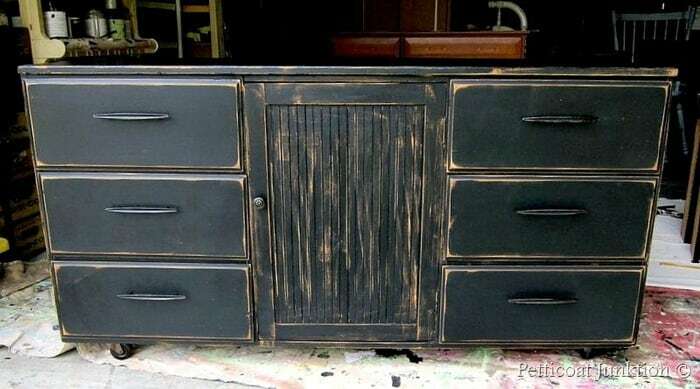 No kidding, I roll it around the workshop just for the heck of it.I used Beyond Paint in Licorice for this makeover too. Because of the roughness of the piece I wanted to really distress it and play up the details. I think it worked. 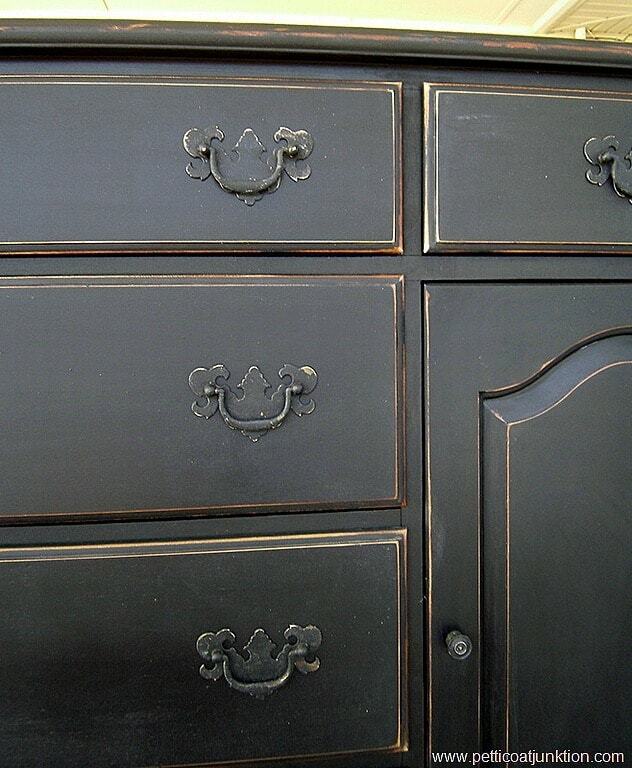 I found a replacement knob for the cabinet door and spray painted all of the hardware satin black. The table and chairs belong to one of my regular clients and she wanted a custom paint job. We removed the legs from the table when we picked up the furniture. The picture on the left is of the table top, legs, and extra leaf and the picture on the right shows two of the six chairs. 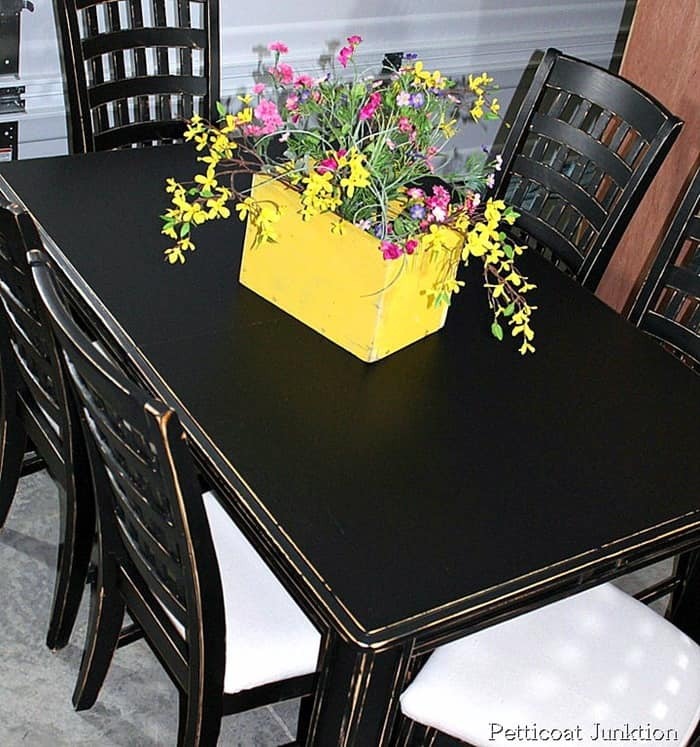 Drop cloth covered chair seats and Beyond Paint (again) in licorice took this dining room set from ho-hum to classy! You didn’t know drop cloths could be classy did you? I love the drop cloth idea because the color is neutral and the drop cloth is very inexpensive. I decided to go heavy on the distressing for the chairs. I used an electric sander with 100 grit sandpaper. My distressing technique is to “go to town” with the sander…. no perfection……. no matching sides…. no “I just came from the store look”. What a difference from how the table and chairs looked before the makeover. Just goes to show you don’t need fancy fabric and special paint finishes to achieve a sophisticated look. This is the last makeover in the list today. I call this piece a sideboard but a friend of mine from way up North calls it a credenza. Doesn’t really matter to me. Most of the hardware vibrated off in the truck on the way home. I guess it wasn’t screwed on real well. They don’t make furniture like this anymore. The drawers on each end are divided for silverware storage and blue felt lines the bottom of the drawer. 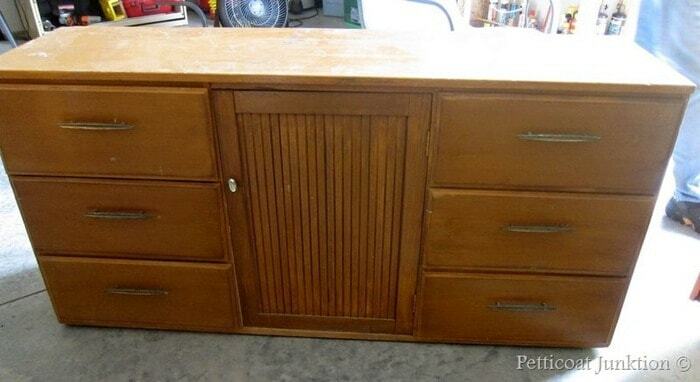 The dust boards in between the drawers are solid wood as is the back plate. I love it when I find a piece like this to work on. I brushed on a coat of Caromal Colours Textured Basecoat Paint in Peppercorn (black, obviously) and finished it with a layer of Beyond Paint in Licorice to give it a slight sheen.I applied neutral Liberon wax after distressing to give the raw wood a dark aged look. I also painted and distressed the hardware. 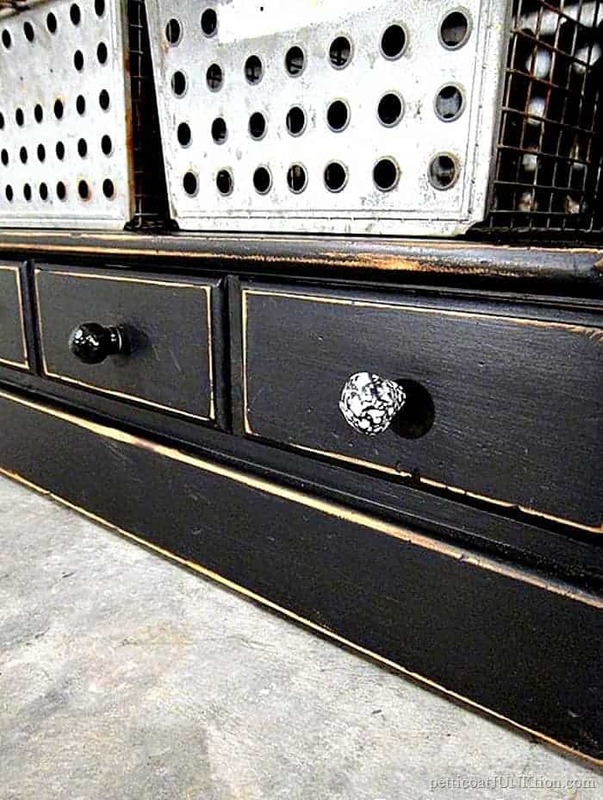 Painting the hardware to blend in with the paint on the buffet doesn’t draw your eye and distract from the over all look. What do you guys think of the pieces and the idea that sometimes it just takes one thing to make the perfect furniture makeover? 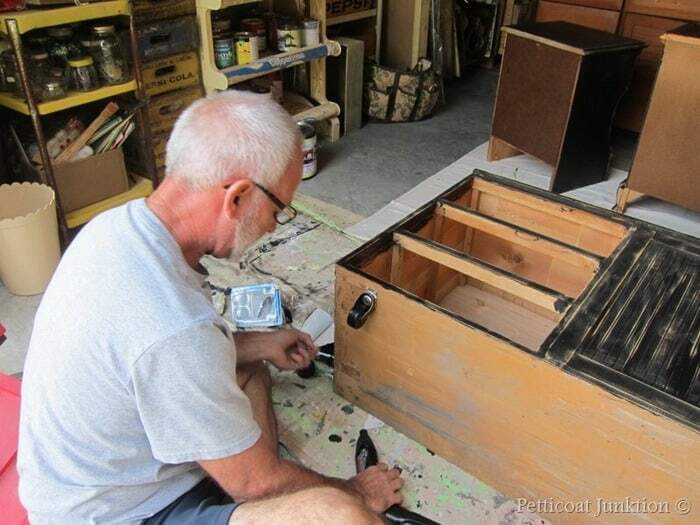 For these four makeovers that was; the applique for the TV stand, the casters for the cabinet, the drop cloth seats for the dining table chairs, and the painted hardware for the buffet. The four projects are makeovers from the past but most of you haven’t seen them. They are buried under a ton of posts and makeovers. The buffet was painted over 6 years ago. I’ve been going through old posts and deleting the ones that aren’t relevant anymore, like information about paint workshops. No one needs to know the date and details for paint workshops from 5 years ago. During the process I’m picking out favorite projects I think you guys would like to see. The photography wasn’t that great in the early days and I don’t have the original photos to edit anymore. I learned a few years ago not to delete my original photos. If you are tired of black furniture you might like the vintage radio cabinet here…..Turquoise and Green Radio Cabinet. I too, love your makeovers and how you and the JTS work so well together! haha, most of the time we work well together. I don’t know how he puts up with me! Those are all stunning, Marie! And I totally agree that one thing can make a piece. You nailed it for every one of those projects. A great post. I really enjoyed it! Beautiful!!! Love them all, so inspiring. Always like your makeovers Kathy!!!! Why do you scrape up all your pieces, makes them look shabby? Beautiful makeovers. 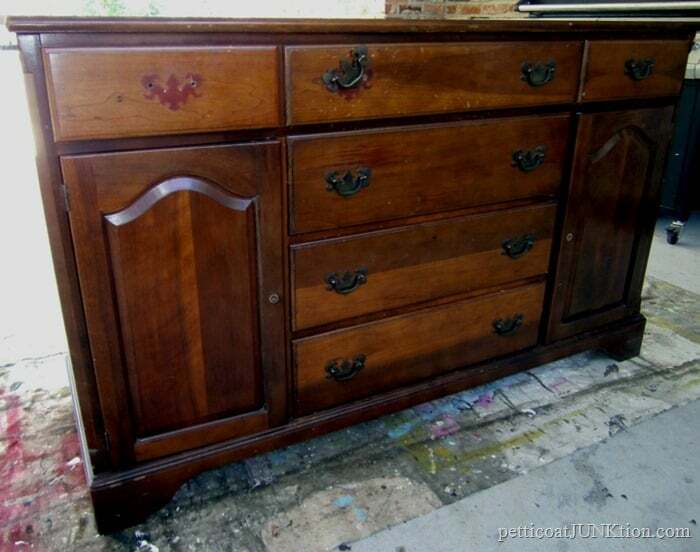 I did the same painting and distressing of original hardware for a secretary, and it looked great, just like yours. I’ll have to check out the paint you’re using. I have used small wood appliques to cover heart cutouts and such, but your use of the applique to hide the curved edge is brilliant! I love it. 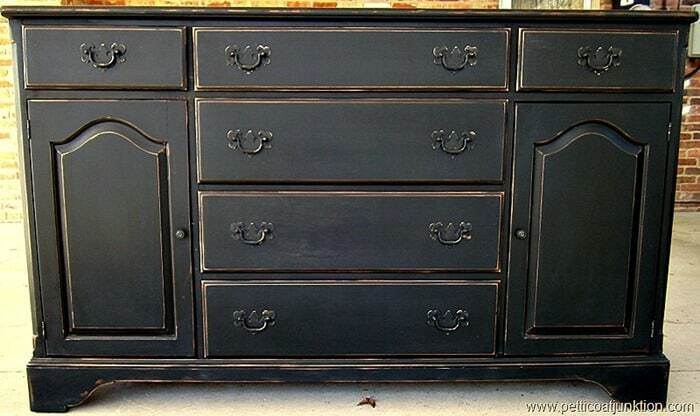 I’m really liking the flat black paint on furniture! Would definitely like to try this on something I do. You are certainly not alone in finding it harder to search out real wood. Here in the UK composite board or stuff which resembles compressed cardboard is the order of the day. Wood when you can get it is often poor quality with a cheap veneer over chipboard. Too late I have learned my lesson: never throw wood away! I really have to hunt for it now. Love all these gorgeous projects. I think a signature black painted piece can make a room. I love all those pieces. It is very hard to find good old pieces any more. You always inspire me. You showed today were great. Thanks a bunch, keep them coming! I really enjoyed seeing the makeovers. Your work is so good. I am thinking of painting our bedroom set. I’m new to this and get excited and then rush in and make a mistake. 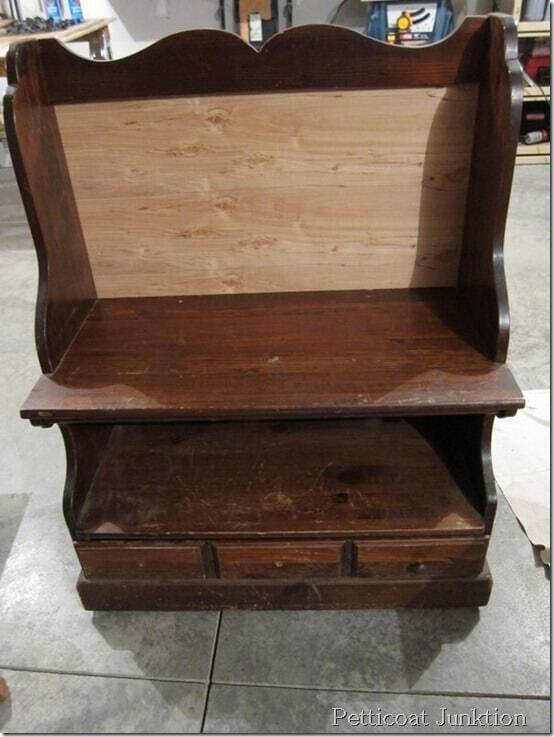 If I paint my furniture(it is wood, just don’t know what kind) would I need to seal the paint to keep from chipping. I can be a little hard on stuff and wondered. I read that the beyond paint seals itself. Where would I find that paint. It’s not a name I know. Thank you. Love the Furniture make overs… I would like to try some only using a Navy Blue or even Barn Red… Great Finds and I love Real Wood Furniture…The Cheap Pressed Wood with Contact paper Wood look doesn’t do it for me either… Although I did Rescue a Stand from the Trash in a Yard as i was driving by. that had Real Oak Spindles that I sanded and lightly added some darker Stain. the 3 Shelves were that Cheap Pressed Wood stuff.. I gave the Whole thing a Good Scrubbing and Sanding and rubbed stain over Every thing -Covered some Scratches… Gave it about 3 coats of a spray poly and gave it to a Friend to use in her apt. for her Microwave.. and she wanted to put Contact paper on the top before I refinished it..? I told her No Way… it looked Brand new by the time I got it all done… Only cost me for the poly.